How Do You Complete a Table By Plugging in Values? 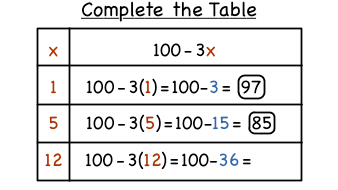 Learning how to complete a table of values is a building block of math. You can use a table to see a pattern or even make a graph! This tutorial shows you how to complete a table when you're given an expression and multiple values to plug in. Evaluate expressions at specific values of their variables. Include expressions that arise from formulas used in real-world problems. Perform arithmetic operations, including those involving whole-number exponents, in the conventional order when there are no parentheses to specify a particular order (Order of Operations). How Do You Simplify an Expression Using the Order of Operations? You can't simplify an expression without fully understanding the order of operation! Follow along with this tutorial to see how to use the order of operations to simplify an expression.